갤러리 세줄은 2001년 개관한 이래 평창동의 미술 문화를 주도하고 있는 화랑들 중 하나이다.1층의 제1전시장, 2층의 제2전시장은 각 50평으로 5m에 달하는 높이와 깔끔한 입방체의 미니멀한 공간을 이루고 있는 전시장으로 모든 장르의 전시를 수용할 수 있고 작가라면 누구나 한번쯤 전시하고픈 공간이다.개관전(展)으로 프랑스 출신의 세계적 전위예술가인『오를랑(Orlan)전(展)』『박서보 드로잉-에스키스 전(展)』을 비롯 프랑스 크리스탈 설치 작가인『미셸 블롱델(Michèle Blondel)전(展)』과 같은 주요한 전시로 평단의 주목을 받았다. 또한 관람객들과 함께 문화를 공유하고자 장르의 구분 없이 다양하고 참신한 기획을 통해 미술계에서는 널리 인정받고 있다.세줄 갤러리의 전시방향은 작가들의 면밀한 자료 분석을 통해 국내외를 통틀어 확실한 입지를 가진 중견작가들의 전시와 대규모 화랑에서의 전시기회가 전무한 참신하고 독창적인 작업을 하고 있는 30대 안팎의 신진작가들에게 그 문을 열고 있다. 젊은 작가들을 위한 대표적인 예가 『Funny Sculpture – Funny Painting 전(展)』이다. 이 전시는 신진 작가들의 육성프로그램으로 매년 우리나라미술을 이끌어나갈 차세대 작가들에게 등용문으로 개방되는 기획시리즈이다. 2002년『Funny Sculpture – Funny Painting 전(展)』의 시작으로 2003년 5월의 두 번째 전시에는 삶의 방식이나 작품의 스타일이 다양한 젊은 작가들이 기발한 상상력에 의해 펼쳐지는 퍼니(Funny)라는 개념에 접근함으로써 그 함축적 의미를 생각해볼 수 있었던 전시로 관객들과 각종 매체, 평론가들에게 폭발적인 호응을 얻었다. 또한 갤러리 세줄은 신진작가 육성 프로그램과 전시 기획안 공모를 통하여 젊고 재능 있는 작가들의 창작의지를 고취하여 계속해서 작품을 해나갈 수 있는 계기를 마련하면서 이러한 작가들 중심으로 해외 아트페어를 준비하고 있다. 그리고 해외미술시장에 등용될만한 젊은 작가들에 주안점을 두고, 이들과 함께 한국미술을 국제시장에 홍보하고 세계적인 입지를 굳히는 것에 주력할 계획이다. 작가와 갤러리와 관람객의 뜻을 모아 삼위일체가 되자는 의미가 담긴 세줄 갤러리는 회화, 사진, 판화, 조각, 미디어영상 등 모든 장르를 다루면서 앞으로 더욱더 우리나라의 미술문화를 활성화하고 풍요롭게 만들고자 열심히 노력하고 있다. 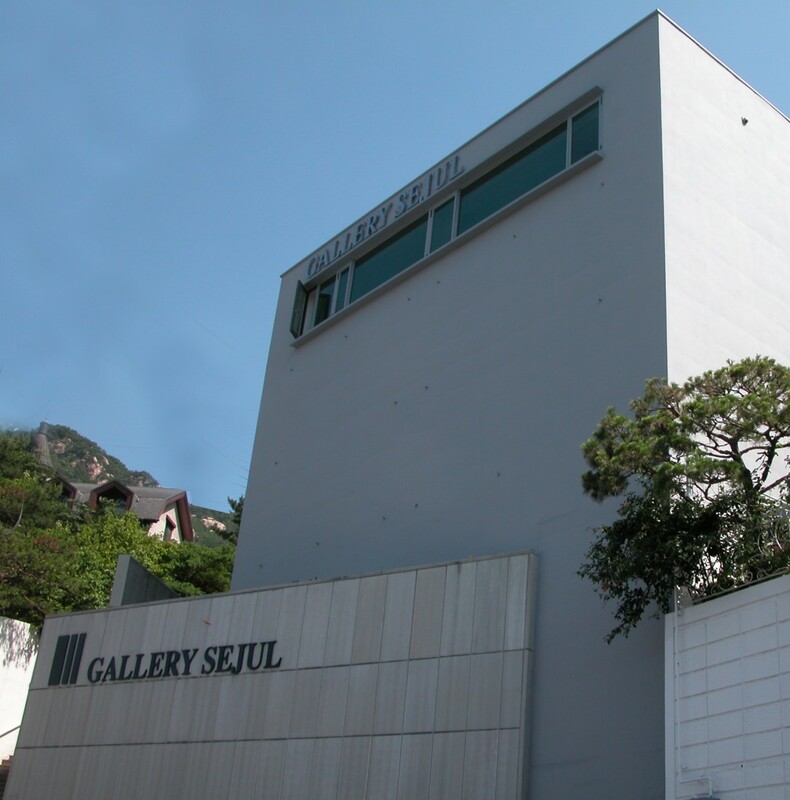 Gallery Sejul is one of the leaders of art culture in pyung-chang area in Seoul. It has a neat and simple exhibition zone and is divided into two spaces. The first space is situated the first floor which has height of 3.8m and covers an area of 165㎟, the second one is situated the second floor which has height of 4.5m and the same floor space as the first. These exhibition spaces can involve all kinds of art genre, so most artists hope to hold their exhibition once in gallery Sejul. Gallery Sejul held 『Orlan Exhibition』which was famous for the reverse of a western standard of the beauty by displaying photographs, 『Park, Seo-bo Drawing Exhibition』which for the creating of his own work style by using the Korean traditional paper ‘Han-Ji’, and 『Michèle Blondel Exhibition』which for the re-construction of the Greek mythology by installing works of crystal. These exhibitions got favorable criticism for the novel planning powers of Sejul. One of them is to make exhibition shared with the spectators which interest the cultural critic. Curating direction of Sejul is to open an exhibition of major artists which have totally successes in establishing their own style and to give a new artist opportunity to exhibit through careful analysis of the archived portfolio. A program as supporting young artists is 『Funny Sculpture Funny Painting』which is annual exhibition since 2002. This program lets young artists have opportunity to hold an exhibition in Gallery Sejul. The second exhibition, May 2003, achieved great success in satisfying media, press, spectators, and critic and approaching to concept of ‘Funny’ which is re-constructed by energetically potential young artists. Gallery Sejul has a program of supporting young artists and a contest of planning exhibition to inspire them not only to go on working but also to prepare overseas art fair. Also Gallery Sejul will focus on consolidate Korean art’s footing position in the world with them. Sejul which means the breast trinity(artist, gallery, spectator) deals with every genre like painting, photograph, printing, sculpture, and media art and tries to stimulate and bloom Korean art.